R. A. Torrey was educated at Yale University; he also studied at Leipzig and Erlangen Universities in Germany. 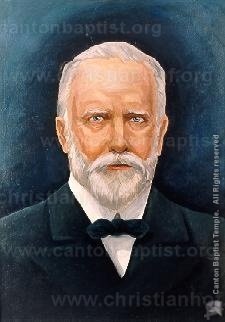 In 1889 he was called to Chicago to supervise the Moody Bible Institute and serve as pastor of the Moody Memorial Church; he served until 1908. He toured the world conducting evangelistic campaigns with song leader Charles Alexander. They held meetings in Tasmania, Australia, China, Japan, India, Canada, Great Britain, Germany and the United States. Torrey served as dean of the Bible Institute of Los Angeles (BIOLA) from 1912-24; he also served as pastor of the Church of the Open Door in Los Angeles. He authored more than forty books on salvation, soul winning, and theology.